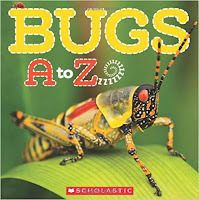 Bugs A to Z alphabet book is ideal for children ages 4 and up. This book appeals to younger children learning their alphabet, but it also has rich vocabulary and can be used with students through third or fourth grade. 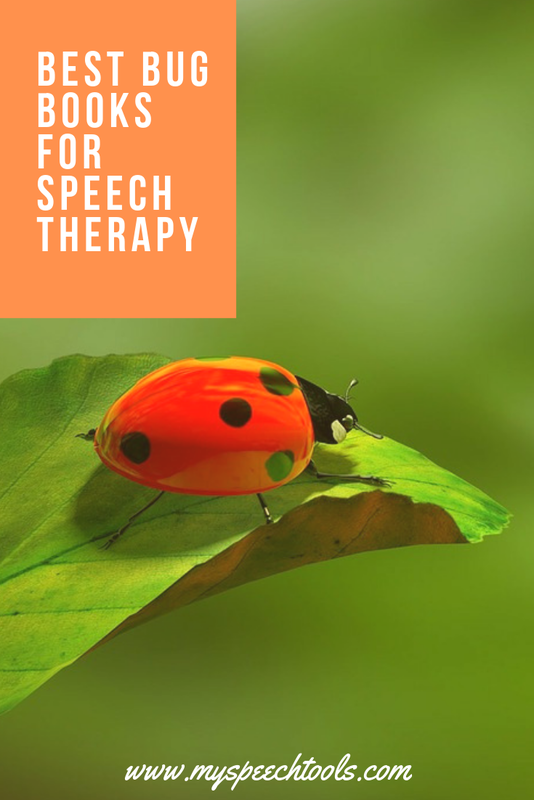 Speech therapy goals may include: articulation, fact/opinion, main idea and details, phonological awareness, compare/contrast, describing by attributes, similarities/differences, and text-self connections. 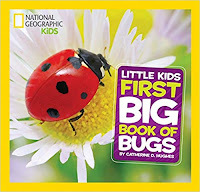 This National Geographic Kids Books Little Kid First Big Book of Bugs includes beautiful photographs of common backyard bugs along with exotic and interesting bugs. The pages are bright and colorful. The non-fiction text features (labels, graphics, captions, bold print, headings) are easy to identify and read. The content is perfect for eliciting conversation. 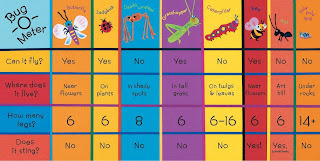 This bug book can be used in therapy with preschoolers through 3rd grade. Speech therapy goals may include: auditory memory for details, main idea and details, vocabulary development, and categorizing. You can also use the text as a springboard for writing prompts with older students. 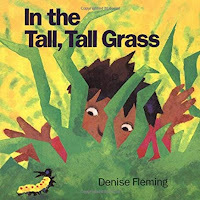 In the Tall, Tall Grass by Denise Fleming has rich vocabulary, such as: "glide, sip, swoop" and "glow." It's engaging simple text is ideal for students in preschool through first grade. 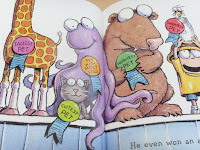 The fun rhyming text (go/glow, swoop/loop) can easily be extended with phonemic and phonological awareness activities. Students can identify, sort, and extend rhyming patterns, segment and blend onset-rime (sw-oop), and segment and blend phonemes (s-n-a-p, f-l-a-p). 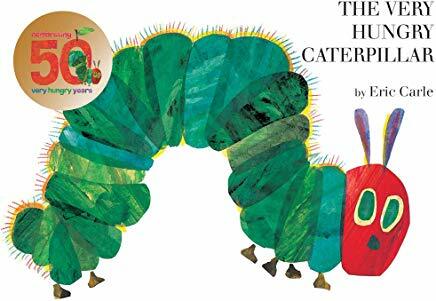 We can't talk about bugs without mentioning Eric Carle's The Very Hungry Caterpillar. This classic book is a favorite among speech-language pathologists who target sequencing, story retell (first, next, then, last), and "beginning-middle-end" with props. Snacks and craft activities are a few of my favorite story extension activities. The repetitive and predictable text "Still hungry" can also be programmed for AAC users. Lastly, Ted Arnold's Hi! Fly Guy was written for students in Kindergarten through second grade. The Fly Guy series includes easy readers with controlled vocabulary. The easy reader chapter books also provide descriptive adjectives, and tier 2 vocabulary such as, "caught, amazing, slimy, rescue." Speech therapy goals may include: vocabulary extension activities, segmenting and blending 3-4 phoneme words (dad, got, pet, pest), wh-questions, Fly Guy character traits, comparing characters (boy vs. fly) using a Venn Diagram, setting, and main idea. 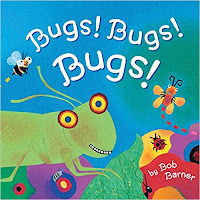 If you are "busy as a bee" and planning bug thematic activities, I hope you will include a few of the bug books mentioned in this post. Don't forget to sign up for my newsletter and stay informed on new product releases, therapy tips and resources, and upcoming Teachers Pay Teachers (TPT) sales.